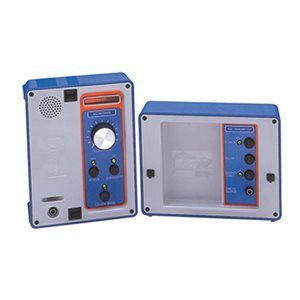 The Split-box Pipe and Cable Locator is a hand-held instrument in the classic split-box design, consisting of a transmitter and a receiver. The instrument traces underground conductive networks such as water and gas mains, telephone, cable TV, and electric power cables. It determines buried lines depth and locates underground metallic masses such as valve caps and manhole covers. Designed with patented super-inductive technology, the Split-box Pipe and Cable Locator is lightweight, portable, and easy to use. For easy transport, the instrument and accessories are supplied with a protective tote bag.